One year ago Brighton and Hove City Council started redeveloping the Seven Dials roundabout. They wanted to remove the pelican crossing in Vernon Terrace and put a zebra crossing in its place. They believed that the ancient and rare elm tree at the corner of the terrace was going to obscure the line of vision for drivers entering Vernon Terrace. Considering this to be to be unsafe, their remedy was to cut the tree to improve visibility. Seven Dials elm tree: Original artwork by Cecil Rice. Click on image to open larger version in a new window. At the news that the elm might be cut, local people were astonished and dismayed; a group from the surrounding communities mounted a campaign.Their suggestion was that the council should extend the pavement around the tree. Word that the ancient tree was in danger spread rapidly into the larger community. There were public meetings, protests, support banners hung on the elm; two campaigners even climbed and ‘tree sat’ to highlight the issue. A petition of over 4,000 signatures was collected and presented to Brighton and Hove City Council who debated the issue at a full council meeting. There was much celebrating by the campaigners when the call to save the tree was passed unanimously. 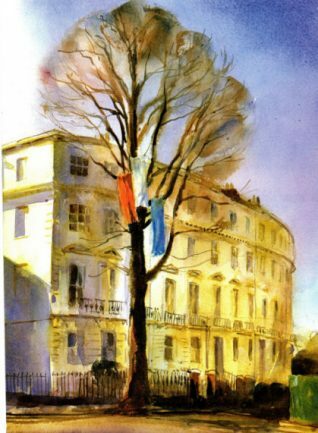 During the campaign, well known local artist Cecil Rice made a water colour painting of the elm tree, and donated 2,000 cards of his work to raise funds. Today some of the local campaigners planted a new tree in the area, and are hoping to buy more trees from the profits of the card sales. 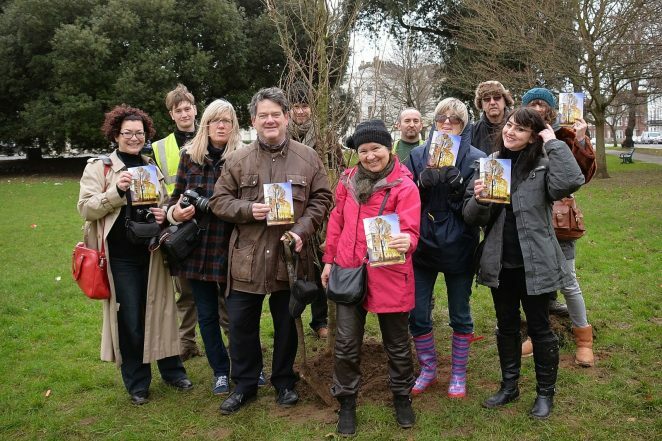 If you missed the campaign to save the elm you can still read about it here. Such a gathering of good people saved that beautiful Elm tree, there are few enough of them as it is. To my mind it is a crime when trees are cut down for flimsy reasons. Trees are thankfully long standing parts of nature and should be treated with the respect that they merit. I am a watercolour painter myself and I love the painting by Cecil Rice, so full of artistic meaning.